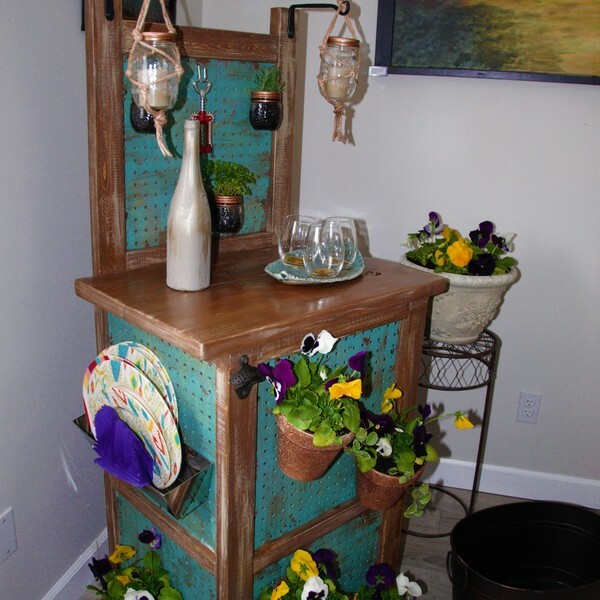 In our small shop, we love to repurpose and upcycle. 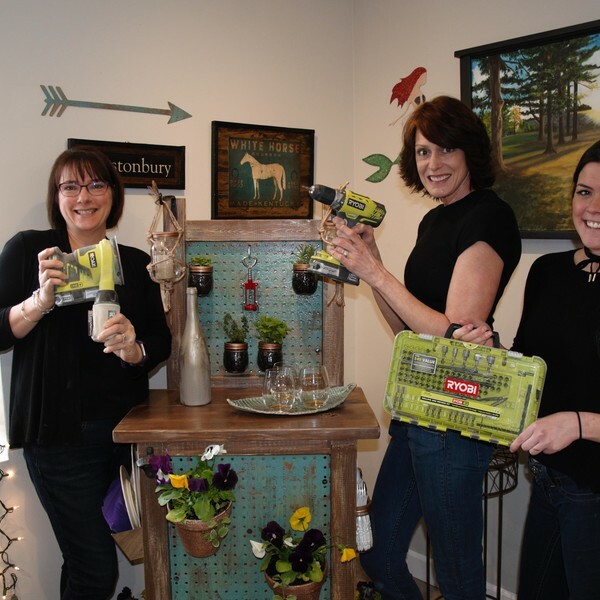 When we saw the RYOBI Pegboard Challenge, we immediately knew we wanted to create a multifunctional “Outdoor Oasis”. 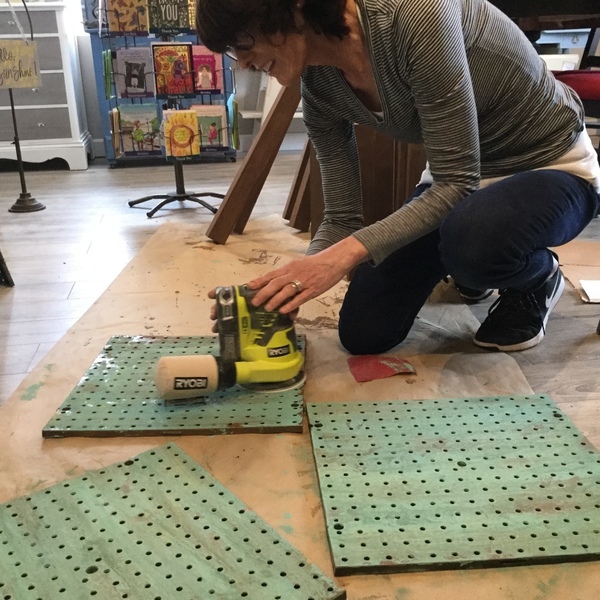 Plastic pegboard was key in creating an attractive outdoor rustic utility cart, which is pleasing to the eye and can be used for a variety of purposes. 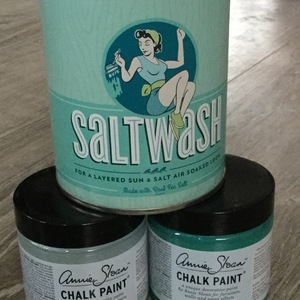 Begin by Saltwashing 6 flower pots, allow to dry. Use RYOBI Jigsaw for cut list and cut connectors from sides of Pegboard tiles. The RYOBI Drill and Kreg Jig made quick pocket holes in both ends of all 13 cross bars. 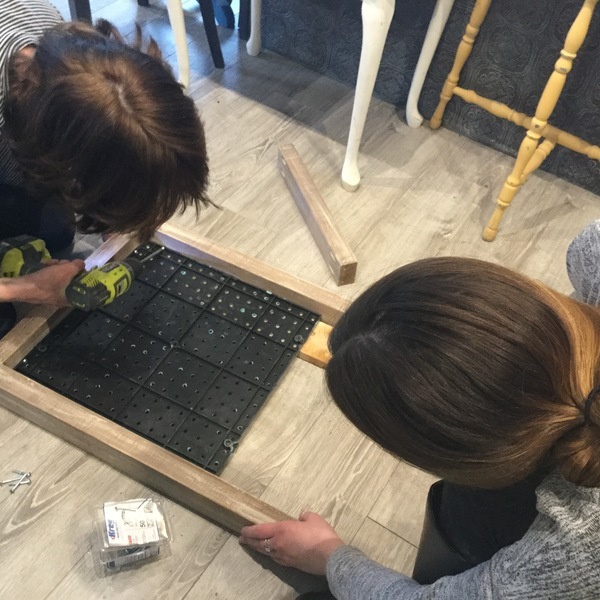 Prepare tiles by drilling 3 holes in all 4 sides of each tile. Take front and back post, screw 16“ board across the bottom, screw 3 sides of Pegboard tile to the front, base and side. 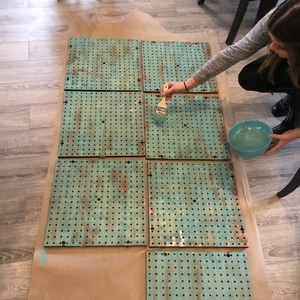 Attach next 16” board, screw top of the 1st pegboard tile, and continue to attach 2nd pegboard tile, complete with final 16” board. Pay attention to making a left and right side! Take (3) 16” boards and attach with tiles to join the sides together forming the front. 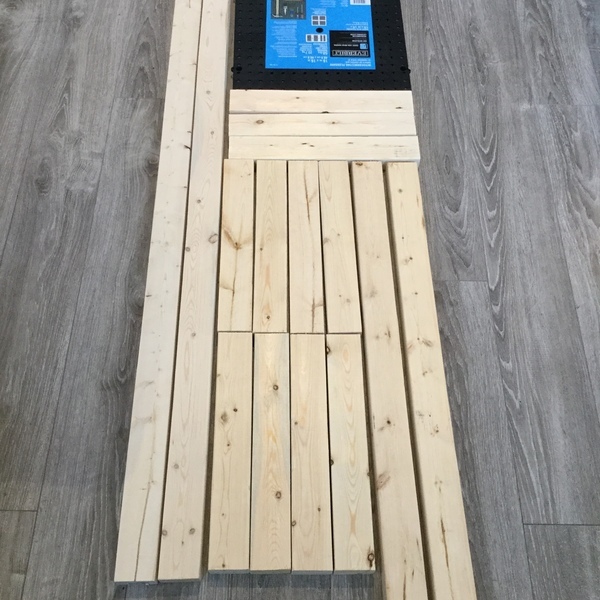 To add a back Pegboard, attach (2) 16” and (2) 18 3/8” boards to tile, then add two hinges on top to allow access to back side of the front tile. We attached the reclaimed wood top by drilling holes through the base and sealed entire project with coat of exterior SPAR Urethane. 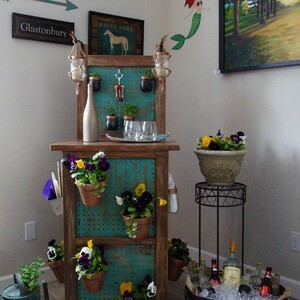 Drill holes into the mud pan, plant flowers and herbs, attach all flower pots and canning jars with zip ties. Install wine glass hangers on the inside and create a floating shelf with scrap wood. The project really came together when we attached an old bottle opener on the front! Wallah! In our small shop, we love to repurpose and upcycle. When we saw the RYOBI Pegboard Challenge, we immediately knew we wanted to create a multifunctional “Outdoor Oasis”. Plastic pegboard was key in creating an attractive outdoor rustic utility cart, which is pleasing to the eye and can be used for a variety of purposes. Begin by Saltwashing 6 flower pots, allow to dry. 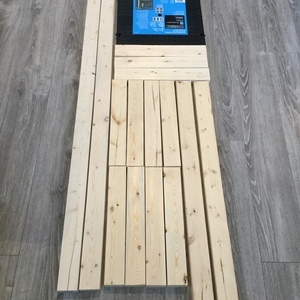 Use RYOBI Jigsaw for cut list and cut connectors from sides of Pegboard tiles. The RYOBI Drill and Kreg Jig made quick pocket holes in both ends of all 13 cross bars. Prepare tiles by drilling 3 holes in all 4 sides of each tile. Take front and back post, screw 16“ board across the bottom, screw 3 sides of Pegboard tile to the front, base and side. Attach next 16” board, screw top of the 1st pegboard tile, and continue to attach 2nd pegboard tile, complete with final 16” board. Pay attention to making a left and right side! Take (3) 16” boards and attach with tiles to join the sides together forming the front. 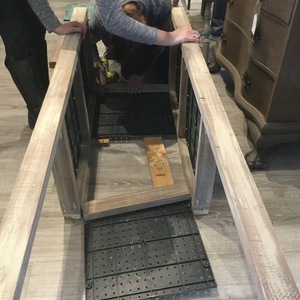 To add a back Pegboard, attach (2) 16” and (2) 18 3/8” boards to tile, then add two hinges on top to allow access to back side of the front tile. We attached the reclaimed wood top by drilling holes through the base and sealed entire project with coat of exterior SPAR Urethane. Drill holes into the mud pan, plant flowers and herbs, attach all flower pots and canning jars with zip ties. 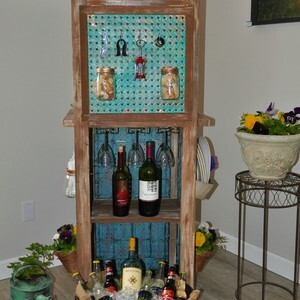 Install wine glass hangers on the inside and create a floating shelf with scrap wood. The project really came together when we attached an old bottle opener on the front! Wallah!